696. Maria Consuelo ROCO was born on Nov 9 1962 in Manila. She was educated Commerce Major in Business Administration in 1984 in University of Sto. Thomas. She is also known as Connie. She is a Claims Analyst for Schaller Anderson. 1139 i. Catherine Heather GARDIOLA was born on Mar 7 1989 in La Mirada, Ca.. She is also known as Heather. She is currently studying at Akimel Middle School. 1140 ii. 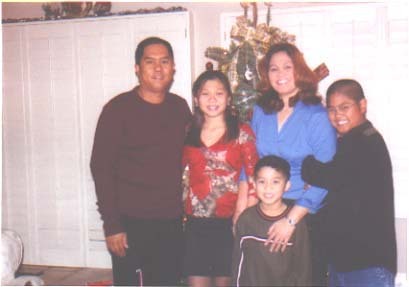 Andrei John GARDIOLA was born on May 5 1991 in Fountain Valley, Ca.. He is also known as Anjo. He is currently studying at Akimel Middle School. 1141 iii. Derick Michael GARDIOLA was born on Dec 5 1995 in Corona, Ca.. He is currently studying at Milenio Elementary School.